English: Brown bird, gray trembler, (Caribbean) trembling thrush; French: Trembleur brun; German: Zitterdrossel; Spanish: Temblador Castaño. 9-10 in (23-25.5 m); 1.8 oz (50 g) (average). Upperparts dark olivaceous-brown, with blackish brown crown and rufescent rump. Underparts dull gray-brown, becoming orange-brown on belly. Eyes light yellow. Bill long, slender and decurved, black; legs brown. 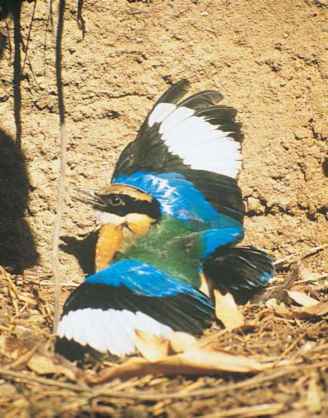 Females have longer bill than males; juveniles faintly spotted on chest. C. r. ruficauda Dominica, West Indies; C. r. tremula Saba south to Guadeloupe, W.I. ; C. r. tenebrosa, St. Vincent, W.I. Wet forest with epiphytes, more rarely in grapefruit, cacao, and banana plantations. Occurs at all levels from the ground to tree-crowns. Occurs in pairs or small groups. Has peculiar habit of trembling, consisting of drooping both wings then quickly bringing them upwards while jerking the tail nervously. On ground it hops with cocked tail. Song is varied; loud notes uttered at intervals, some rich and warbled, others harsh or squeaky. Food very varied; much invertebrate matter including insects, spiders, scorpions, and snails, also small tree-frogs and lizards. Fruit and berries including seedpods. Feeds at all levels; probes into ground and epiphytes with long bill; clings to tree trunks while probing into cavities in the manner of a woodcreeper. Nest is a cup of rootlets, lined with finer material, in the base of a palm frond, in a tree cavity, or in a hollow stump; may use nest-boxes. Some nests reported to be domed with a side entrance. Eggs two to three, unmarked greenish blue. Incubation and fledging periods not recorded. duced due to habitat destruction, but still abundant on Dominica and common on Guadeloupe and Saba. Extinct on St. Eustatius.